As a citizen of the EU you’ll have no trouble relocating to and working in Madrid. While the overwhelming majority of the population speak Spanish there are very many courses on offer for new students and intermediate speakers of the language alike. A deep immersion in the culture will see both improve incredibly rapidly. 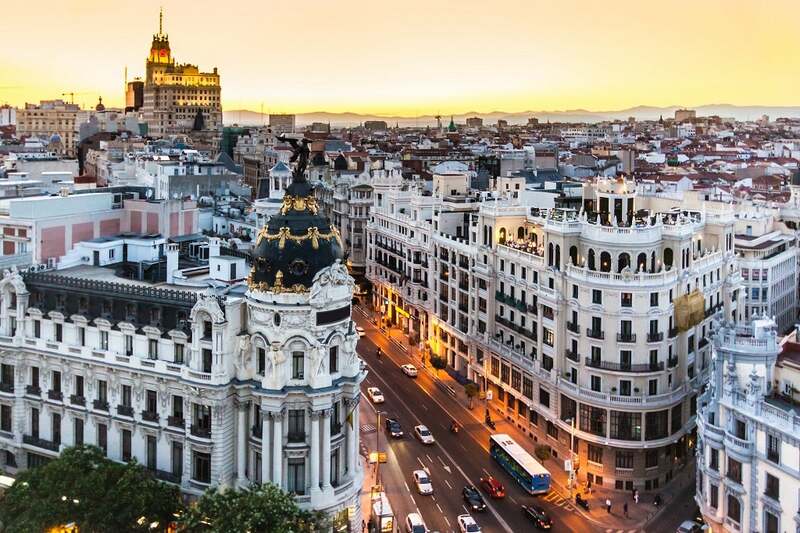 The climate in Madrid is much warmer than you’ll find in most of the UK: while Madrid’s high altitude can lead to cool winters and even the odd snow shower, temperatures rarely drop below freezing. Unfortunately the labour market in Madrid has seen worsening conditions since the financial crisis (Spain’s property market collapsed along with many other countries’) and continuing through the European sovereign debt crisis. Unemployment in the city stood at 19.88% at the end of 2012. Anyone moving to Spain without the promise of work should give careful consideration to this statistic. Madrid’s public transport system is extensive and highly developed. Given that parking is difficult and cycling is well provisioned, only those living in outer suburbs which aren’t serviced by the Metro will feel the need for a car. Spain has publicly funded healthcare which many rate as the equal, if not the better, of the NHS. Those moving from London to Madrid without taking a cut in salary can expect their money to go a lot further in the Spanish capital. Prices at the supermarket, the restaurant and the bar will all be found to be lower. In addition, you can expect to pay nearly 50% less in Madrid on rent than you would on a comparable apartment in London and property is much more affordable. Madrid sees, on average, 87% more hours of sunshine per year than London and the Manzanares River, while not as wide as the Thames, provides an equally soothing escape from summer high temperatures well in excess of 30 °C. Madrid is as much the keystone of Spanish cultural life as London is of the UK’s. While little of medieval Spain remains, the Moorish towers of San Nicolás and San Pedro el Viejo churches are some of Madrid’s finest architectural examples of that period and neatly bookend a range that runs rampant through the Renaissance (e.g. the Convent of Las Descalzas Reales), the Bourbon period (e.g. St. Michael’s Basilica) and the early 20th century (e.g. the showcase of the Gran Vía), before bursting into the 21st with modern masterpieces like the 4th terminal of the Madrid Barajas International Airport. A large Spanish property bubble popped in 2008 leading to falling house prices ever since. While Madrid, as the financial centre of Spain, was inoculated against the worst of the drops nevertheless, in 2012 house prices fell by at least a 4.2% in the Spanish capital. These price drops, as in Ireland and Greece, are due to large-scale overbuilding during the boom and the number of properties available far outstripping demand. Unless you’re looking to buy a luxury property then, or one which is very centrally located. (the prices of which are generally more resilient in a slump) buyers are advised to proceed with caution. The current average house price in Madrid is €2,500 (£2,119) per square metre. A three bedroom apartment in the exclusive Barrio de Salamanca is likely to cost in the region of €1.9m (£1.61m) whereas there are 3 bedroom apartments at the other end of the scale which have been foreclosed and which can be picked up for closer to €60,000 (£50,850). Purchasing property in Spain leaves the buyer eligible for transfer tax (between 8% and 10% of the purchase price), stamp duty (1.2%) and, on newly built properties, VAT of 4%. Spanish estate agents also charge typical fees of 6% which are sometimes split between buyer and seller, but more often fall to the buyer. You can rent a one bedroom apartment in the centre of Madrid for roughly €700 (£593) per month. Family Friendly: Chamberi, southwest of Salamanca, closes its major street and square every Sunday to allow children to play. Hip and Trendy: The Barrio de las Letras (or Heurtas) has a flavour of the old Madrid, tapas bars and nightspots. Upmarket: The Salamanca Barrio is exclusive, chic and has all the best hotels. Up and Coming: Triball, north of the Calle Gran Via, is the home of Madrid’s coolest fashionistas. While Spain provides a free state education, unless your child already speaks Spanish, or you expect them to pick it up quickly, as an expat you’re more likely to opt for one of the many private bilingual or international schools. You can enroll your child in a state school via the local town hall. Parents of secondary school age children must validate their child’s education in their home country by going through a process known as convalidación via the Spanish Ministry of Education. Children will be allotted a place at a school within a certain distance of their home. A subsidised Spanish school – most often a Catholic school – will cahrge around €600 (£508) per year for tuition. Private bilingual or international schools often contain large numbers of Spanish students, so you don’t have to worry about ghettoising your children, and often teach International Baccalaureate programs or the English National Curriculum. The Hastings School and the International School of Madrid are two notable examples which teach in English, charging from €430 to €950 (£364 to £805) per month in fees. Madrid is served by a large number of universities, colleges and business schools, among which the Complutense University of Madrid is one of the oldest in the world, the Universidad Politécnica de Madrid is the largest technical college in Spain and IE Business School has a highly rated International MBA program.